Christmas at Pensychnant by Jan Ruth. This beautiful arts and crafts property became the house where Caroline and Ian lived in my latest novel, GIFT HORSE. 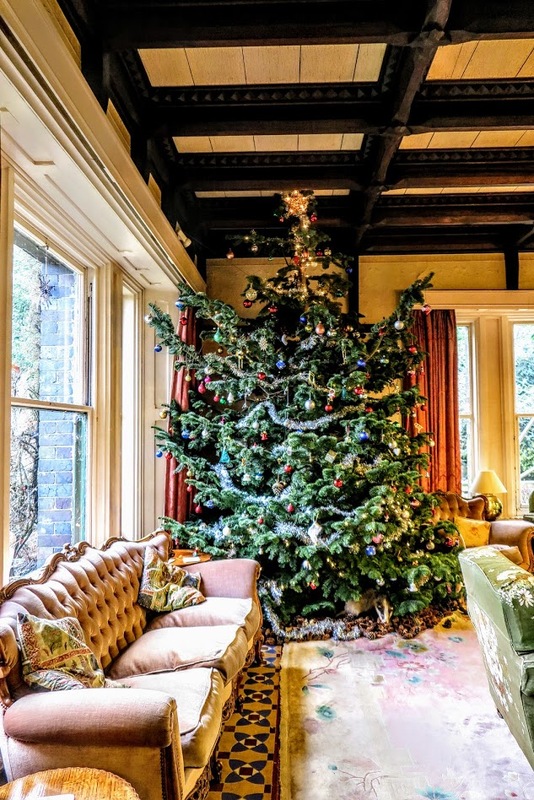 Of course, my story is a contemporary one, but the setting of this house and its history crept under my skin, especially seeing it dressed for Christmas, embracing those old connections and traditions of the Welsh countryside. For me, the elegant shabbiness of the house adds a richness not quite quantifiable in words. I guess it has atmosphere – something a writer is always looking to capture. Pensychnant isn’t a National Trust or Cadw property attracting an entrance fee (although contributions are always encouraged), nor does it house a lot of cordoned-off untouchable valuables. What it does offer is a real, modern experience of a Victorian house. This is partly down to the fact that the house is still very much lived in. The log fires are burned for a great many reasons. Today, Pensychnant works primarily as a conservation centre; holding exhibitions by local wildlife artists, organising guided walks, and of course, the annual Christmas fair when the Welsh dresser is laden with vast quantities of home-baked cakes. When the mill industry collapsed, Pensychnant was sold to the Collins family before it passed to Doctor Tattersall of Conwy. Then, like the stuff of fiction, something wonderful happened when the great grandson of Stott bought back the entire family estate in 1967. The cottage I chose for my protagonist to “live in” in my second novel is in an incredible location on the north Devon coast, about 100 yards from the beach. A couple of years after the book came out I found out that the ancestors of a fellow family historian I’d met on Twitter had lived there and then it appeared in the BBC production of The Night Manager!